Do you need more Slack in your life? Of course you do! 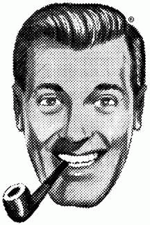 J.R. "Bob" Dobbs can show you the way. Go to Kickstarter right now – or soon, you know, when you get around to it, as Slack permits – and support a documentary about the life and times of "Bob" and the Church of the SubGenius. We here at Illuminati World Headquarters are quite familiar with "Bob" and his disciples, and we're pleased that this project can bring it to a wider audience.